When you give an iam1ru Gift Certificate, you are encouraging Everyday Philanthropy and helping to fulfill the simple needs and dreams of people around the world. An iam1ru Gift Certificate is a meaningful gift for any occasion that lets your recipient choose where they would like to give their support. 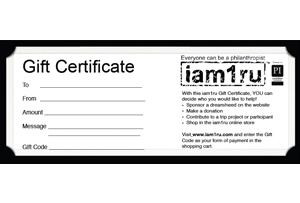 Gift Certificates can be used toward: sponsoring a dream, making a donation, contributing to a trip project or participant, or shopping in the iam1ru online store. Simply fill in the information in the template below, complete your payment and then you will be redirected to the iam1ru website. Voila!….a pdf Gift Certificate will be ready for download. You can send it as an email attachment OR you can print at home and then deliver yourself (in person or in the mail).